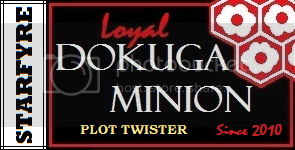 Join your fellow minions in bannerness! I'm 32. Have a kid. Have a dog. I'm in college at Brown Mackie. I'm studying to become an Occupational Therapy Assistant. It's a health care field, I don't help people find jobs. lol. Older sister is fighting stage 4 cancer. So, overall, I don't really have a lot of time to read or write fiction, but I do write to help deal with my PTSD, so it's a good outlet and allows me to escape and still deal with what's bothering me. I'm addicted to reviews. Seriously. I obsess over them constantly. Currently working on a pair of chapter fics for InuYasha for Kagome & Sesshoumaru pairing. My newest fic Blood in the Water, is my response writing to some seriously high levels of insanity. With that said, because of the cause of my sudden need to write, Blood in the Water will be a dark fic, but I will throw in humor to keep it from getting too heavy. So far I've managed daily updates since creating it! Yay me! I am slightly crazy, (Warning: slightly might be an understatement!). I have never been, nor ever will be "normal". I love Cheeze-Its, and Coca~Cola! I can't get enough of them! I am obsessed with FAIRIES!! A little random I know, but this is just the way that I am. There are others too but these are my top all time favorite authors. Mackellar is new but very good, and also a close personal friend. You can find his first work "The Black Flame" on amazon.com. So...That's it. Really. I promise. Badges?! I don't need no stinkin' badges! I just wants them! Mwahahahahaha! Poem by Nicole B. Telles, If you copy please make sure to say who wrote it. Both Parents Retired Army! I Am Very Proud to Say That They Were, Are, Have Been, And Always Will Be My Heroes. Unfortunately I do almost every one of these things! Fortunately my family and friends love and accept me in spite of these things! -If you talk to yourself. -If you live off of sugar and caffeine. -If people start to notice that you tend to check your e-mail every day for a week, then suddenly disappear off the face of the planet. -If your e-mails tend to be pages long and incredibly random. -If, when replying to someone else’s e-mail, you are sometimes so random that you fail to address the original message altogether. -If, no matter where you are in your room, you never have to so much as get up to reach a pen/pencil and paper. -If the letters are starting to wear off on the keys of your keyboard. -If people think you might have A.D.D. -If you think it’d be cool to have A.D.D. -If you start constantly talking in third person, past tense. -If you think about making lists like this, and start giggling for no ‘apparent’ reason. -If your friends don’t even bother to look funny at you anymore when you start giggling for no apparent reason. Even after a year had passed, she couldn't let go. Soon she would be all alone. In the darkness of her shattered heart. In the darkness of a starry night, he pulls her out of her hopelessness. With him, she is not alone, if she can only see it. Returning to the feudal era was not as wonderful as Kagome had expected. How she had come to stand before Sesshoumaru on her wedding night was confusing, and upsetting considering that she had just married his half-brother. Her dream come true just turned out to be a NIGHTMARE! Rated for future updates. 1st chapter edited. Dokuga Exclusive! In the war that rises in the tides, the prince that would be MerKing seeks to claim Kagome as his bride. With the aid of the Western Lord, the true battle begins. Not for a jewel, but for a priestess' heart and her life. This is a Mystery story. Secrets, and plot twists abound. Set in the past but very A/U. Dokuga Exclusive! Naraku had a plot, and it almost worked too. Short one shot where InuYasha is almost smart! Sesshoumaru contemplates funny bones, and Kagome turns purple. Total Crack fic. Some one has been stealing from Kagome's backpack and she's determined to find out who. With the help of her mother, revenge and the truth will be hers. Too bad the culprit won't be the only one to face the consequences. Dokuga Exclusive. Total Crack-fic! I would feel sorry for Sesshoumaru if I wasn't too busy laughing at him - all that time worrying and waiting to save Kagome from the evil clutches of his mother. ;D I think in the end it is Sess who needs saving. Thank you for your review! I just felt like putting that little snippet in there. Glad you enjoyed it! Heya, Star! How have you been? School's giving you hell yet? Thank you for your review on "Chocolate Smiles". I'm glad you enjoyed this little story and thank you for staying with me till its end! Thank you for the wonderful review of the first chapters of Nefarious! I'm so pleased that you enjoy my stuff, since that is, of course, why I write - not only to entertain myself, lol, but everyone else who reads what I write, as well. Hopefully, what's to come won't disappoint you. *giggles* Thanks again for another review. In the beginning there was supposed to be a little flashback in each chapter, but now, the story has taken on a mind of its own. Who knows where it's headed next. How are you, darling? Everything alright in your life lately? You are such a dear to leave a review AGAIN! Not many like to leave an encouraging remark, so it always brightens my day when someone actually takes the time to tell me how I am doing :3 I'm glad you like Hypocrite. It's my favorite that I am writing so far. Trust me, this fic is going to have a lot more emotional turmoil as Sesshomaru learns to become a better man while Kagome is right there trying to help him. Of course he is going to mess up from time to time but that is to be expected. Thanks again for your lovely review!